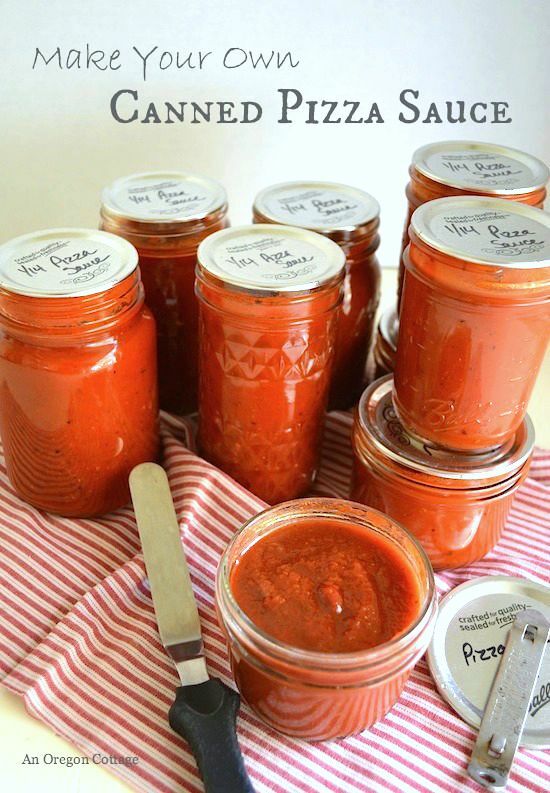 Make your own home canned pizza sauce from fresh tomatoes OR tomatoes that were frozen during the gardening season for convenience and reduced cooking time. 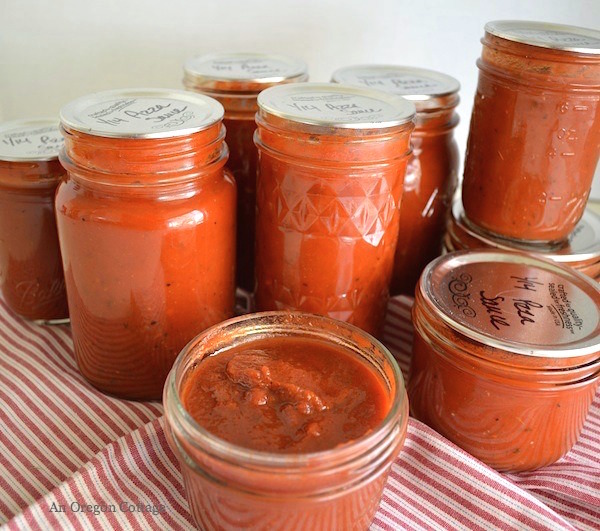 Together with my favorite salsa, roasted tomato sauce, and addictive tomato chutney, this easy, wonderfully seasoned home canned pizza sauce forms the MVP’s of my canning recipes. Meaning, during the tomato harvest, I make enough of these four staples to see us through the year and only if I have any tomatoes left do I make other things like bruschetta topping or rotel. However, for a number of reasons (time issues, weird tomato season, other commitments), I couldn’t find the time to make all our tomato recipes last fall when the tomatoes were coming in fast and furious. We were almost out of the other canned goods, but I had a few cans of pizza sauce left, so I concentrated on the other tomato recipes and just froze enough bags of paste tomatoes (with a few heirlooms thrown in for great flavor) to be able to make the sauce later. In January when things are typically more quiet, I pulled out the frozen tomatoes and decided to show you how I make the pizza sauce from frozen tomatoes. You can actually make this sauce from fresh tomatoes, too, but frozen is my preferred way now since it makes the cooking down part go so much quicker. Read on for all the details! Thaw tomatoes (overnight is good) in a bowl or the sink (in case the bags leak). Drain the accumulated clear juices- open one corner of the baggie and pour off the juice. Run through a food mill to remove the seeds and skins. Pictured above on the left is a Victorio Food Strainer and Sauce Maker. It’s like the little girl with the curl: when it’s good, it’s very very good and when it’s bad…well, you know. Even though Gina mention (in the post I linked to above) that she didn’t heat her frozen tomatoes, this food mill just didn’t want to work with them until I heated them a bit. I ended up reverting back to my vintage metal tripod food press (which you can still buy new here – guess some designs have staying power!) for some of the cold pulp, but it takes more elbow grease, that’s for sure, and doesn’t result in as much usable pulp as the Victorio (I did use the Victorio for applesauce for the first time this year and it worked wonderfully for that!). 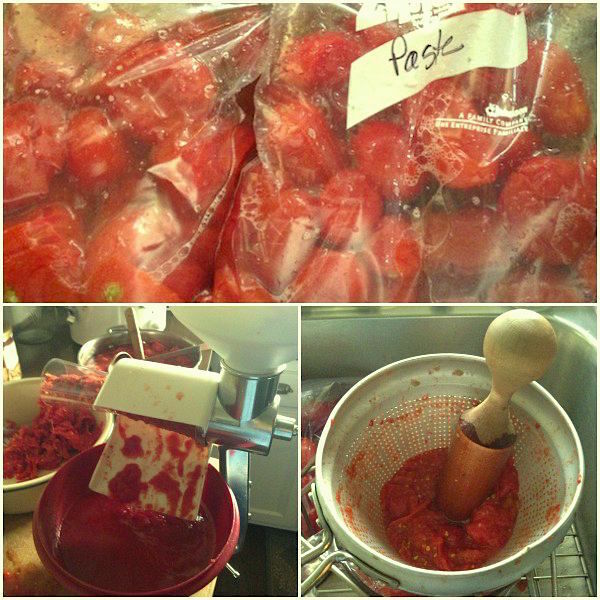 Wash, core, and halve tomatoes. Bring to a boil in a large stock pot. Strain skin and seeds through a food mill. I used the electric FreshTech Harvest Pro Sauce Maker with both the fresh tomatoes shown in the video as well as 12 bags of frozen tomatoes later and it worked fabulous with them both. I had sauce in no time without needing to bother with heating in any form. I truly do love this machine – it really makes this easy! For convenience, can the pizza sauce in half-pint or 12-oz jars which is a good size for medium-to-large sized pizzas. The 12-oz. jars are actually the perfect size (whole pints are too much, which causes the dough to not cook fully in the center) but they’re harder to find, so use what you have. We make our homemade pizza a couple times each month, though sometimes we make it with pesto instead of tomato sauce, and so I aim to have 20-24 jars on our shelves in varying sizes. Oh, and this sauce is also good in any Italian recipe, so it finds its way into things other than pizza – a lot. Click the arrow for the full, printable recipe! My sauce did not thicker after two hours of simmering. I used fresh tomatoes. Any thoughts or suggestions? I would just keep cooking, Melinda, turning the heat up a bit until it’s a consistency you like. Your tomatoes were probably juicier, which happens a lot with fresh tomatoes, especially if you’re not pouring off juice from frozen tomatoes first. I blend spinach into the store brought. Is it safe to can it in this recipe? No, Michele, spinach is low-acid so that would mess with the safety ratios. I’d blend it in when you use it like you do with the store-bought (great idea, by the way!). I’m really looking forward to trying this recipe this year. My family loves homemade pizza and my husband gave me cast iron pizza pans for Christmas. They are amazing! Last year I made salsa and one tip that I thought was wonderful was slicing the tomatoes in half and placing them face-down on a cookie sheet cooking them in the oven and as they cool the skins shrink and come right off. It made the process go so much quicker! What a great tip, Sharon – I’ll have to remember that! Hmmm, that’s a question I haven’t gotten before, Tammy. Since it’s really important for safety reasons that you follow the recipe exactly with tomato products that will be canned to be shelf-stable, I think there’s no other way but to drain your tomatoes and weigh them. The acid ratio only works when using pound measurements for the tomatoes (you can cut the recipe in half safely). I know that won’t be perfect, since the tomatoes weigh differently after being skinned, cored, and canned, but that’s how I would do it. Hello! I just came across your recipe and this looks delicious. With so many tomatoes from my garden this year this recipe was just what I needed. Would it be safe to prepare the tomatoe puree one night and put in the refrigerator and then make the pizza sauce/can it the next night? Yes, you can totally to that Heather! I often do things like that to break up preserving tasks. How long did you water bathe these for? I cannot find it in the recipe. Thank you. Click the arrow at the bottom for the full, printable recipe Bridgette – the article is just the tutorial walking you through the full recipe. ABOUT WHAT YOU SAID ABOUT CHERRY TOMATOES NOT BEING ACIDIC ENOUGH TO MAKE SAUCE, ISN’T THAT WHY WE PUT LEMON JUICE IN EACH JAR? THE CANNING GROUP I’M IN SAYS THAT WE CANNOT BE SURE ANY TOMATOES ARE ACIDIC ENOUGH TO NOT ADD LEMON JUICE. I KNOW THEY CAN’T BE CANNED WITH PEELS ON. Tomatoes are right on the edge of safe acidic levels, Melissa, so the lemon juice is to ensure they are acid enough to be water-bath canned. There are some cherry tomatoes that would be fine, probably, but some (I’m thinking of the pear types and the super sweet cherry types) are known to be low-acid, so I made a blanket statement. I would only use a ph-tested recipe if I were going to can cherry tomatoes since the lemon juice doesn’t automatically make everything safe to can. I can’t find anything from USDA or Extension offices that say it is unsafe to can with washed peels left on (which I routinely do now with salsa and chutney since it’s so much easier!). Only that they may affect texture. In fact, the USDA says “Where recipes call for peeled or skinned tomatoes” (http://nchfp.uga.edu/how/can_salsa/salsa_ingredients.html) which seems to me that either are okay. Yes, it freezes beautifully, LaRae. I canned tomatoes ladt year and got lots of pulp. Im using 7 quarts to this recipe without altering anytging…eccept a little extra sugar because I decided I don’t like the thyme in it. It seems like its making much more. Do you think it’s safe with still just adding the lemon juice to the jars? It’s okay, Trish – maybe your sauce isn’t as thick? You will need to up the lemon juice/citric acid, though, for quart sizes: 2 TB lemon juice or 1/2 tsp. citric acid. Would it be safe to assume that I could cut this recipe in half and the ratios would still be safe for canning? I have lots of ripe tomatoes from my garden but I don’t think I have 22 pounds. Yes, you can halve the recipe safely Nicole – I do that all the time when I have smaller amounts! Have you ever used grape tomatoes? I have more then i kmow what to do with! Not in this, though I do have a roasted cherry tomato sauce that’s delicious. It’s only safe for freezing, though, since cherry tomatoes aren’t as acidic as regular tomatoes. Here’s a link to the recipe. HI! When you say wash, core, and halve tomatoes, then bring them to a boil are you putting them in a pot with water?? No, as the tomatoes cook, they release all the liquid you’ll need to boil. I made this recipie with these changes, extra garlic, fresh tarragon instead of basil, garlic powder, couple of large bell peppers, and all other listed ingredients. Tastes great can’t wait to make a pizza out if it! Yikes, Alison! Sorry, but you can’t add lots of low-acid fresh ingredients like that (garlic, fresh tarragon and peppers) to a canned recipe like this and have it still be safe for water-bath canning. This is per the USDA and my local Extension Office. Did you pressure can this? If not, I would recommend that you keep these jars in the fridge. Is pressure canning the answer to make this recipe safe if adding other fresh ingredients? How many cups of puree comes from 22 lbs of tomatoes? It depends on what kind of food mill you use (some get more pulp/puree from the tomatoes than others) but I’d estimate around 17-18 cups which should cook down to the 14-15 cups to get the 7-8 pint yield. Do you know if it’s safe to use fresh herbs instead of dried? Just curious. Thanks! I forgot to put lemon juice in my first 7 pints. Will it be OK? My question is, I canned all my pizza sauces in pints and in the end it makes 2 pretty large pizzas. So we cant seem to eat 2 pizzas at the same time. How long is the pizza sauce good for after opening and being stored in the refrigerator? I know this is an older post, but I wanted to say “thank you” for it. I stated canning this year, mostly (and hopefully) as Christmas gifts. Pizza sauce was on my list, but I got so tired of reducing it that I gave up and have a few jars of what I hope is at least spaghetti-worthy sauce once I season it. You answered a few of my questions here, mostly in replies to comments. So many bloggers don’t answer, and I hope you feel like you’ve given something of value when you take time to do that. Makes me wish it weren’t mid-October and I could reasonably by enough good tomatoes to try again!